With close to one million members, the Church of the Nazarites (ibandla lamaNazaretha) is one of the most popular indigenous religious communities in South Africa. Founded in 1910 by Isaiah Shembe, it offers South Africans—particularly disadvantaged black women and girls—a way to remake and reconnect to ancient sacred traditions disrupted by colonialism and apartheid. 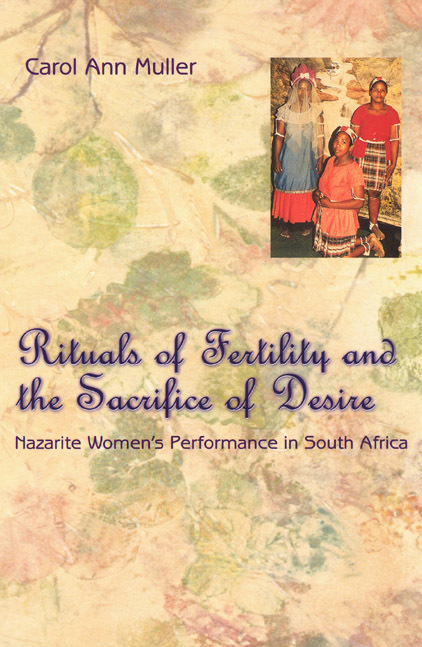 Ethnomusicologist Carol Muller explores the everyday lives of Nazarite women through their religious songs and dances, dream narratives, and fertility rituals, which come to life both musically and visually on CD-ROM. Against the backdrop of South Africa’s turbulent history, Muller shows how Shembe’s ideas of female ritual purity developed as a response to a regime and culture that pushed all things associated with women, cultural expression, and Africanness to the margins. Carol Muller breaks new ground in the study of this changing region and along the way includes fascinating details of her own poignant journey, as a young, white South African woman, to the "other" side of a divided society. 7. Nazarite Marriage and the "Brides of Christ"